FRANKFURT -- Volkswagen's premium car brand Audi sold 108,500 cars last month, 24 percent more cars than a year earlier, thanks mostly to growth in China. October sales in China, Audi's biggest market, were up 62 percent at 27,729 vehicles, accounting for about a quarter of group sales. Since the beginning of the year, the automaker has sold a total of 1.08 million cars worldwide, a rise of 18 percent over 2010 figures and is well on the way to passing its yearly sales record of 1.09 million units set last year. Audi said last week it still expects its 2011 vehicle sales to hit a record level of 1.3 million as all its markets except Western Europe grow. Since January, the carmaker has delivered 253,739 cars in China, a rise of 32.1 percent, the automaker said. In Germany, Audi's October sales remained flat, rising just 0.5 percent to reach 22,308 deliveries. Overall sales this year, in the automaker's second-largest single market, rose 13.2 percent to 207,330 cars. 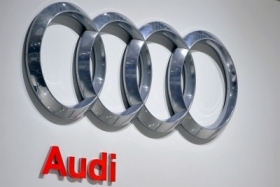 European sales were given a boost by deliveries in Audi's third-largest market, the UK. The brand delivered 7,601 cars in October, a rise of 30.9 percent. From the start of the year, Audi has sold 101,382 units in the UK, a rise of 14.3 percent over last year's figures. Overall in Europe, Audi sold 58,500 cars in October, a year-on-year rise of 9.8 percent. Since the beginning of the year, Audi has sold 610,400 cars in the region, a rise of 12.1 percent. In the United States, the brand sold 10,225 units last month, a rise of 25.8 percent. Between January and October, total sales in the brand's fourth-largest market grew to 95,206 units, a rise of 16.5 percent over 2010 figures. A new line of less expensive and more utilitarian compact cars and growing sales of the automaker's latest C-class model will help Mercedes outsell Audi next year, while BMW will likely extend its luxury lead with next-generation models of the 1 series and 3 series, IHS said.